Hundreds of historic buildings crammed with precious art and antiques are at risk of being destroyed due to a lack of sprinkler systems. 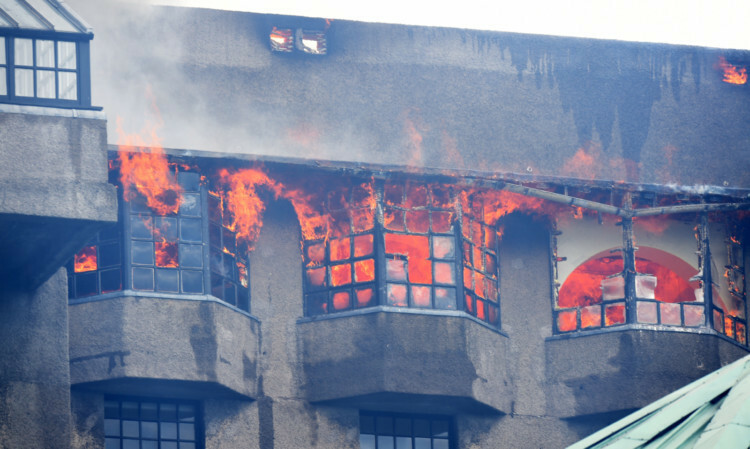 Fire experts have argued many of the nation’s treasures could suffer the same fate as Glasgow School of Art’s Mackintosh building if they aren’t fitted with sprinklers or similar water mist protection systems. The stark warning comes after The Sunday Post last week revealed how the art school was just weeks away from completing the installation of a fire suppression system that could have helped safeguard the iconic architectural gem. On the back of the Mackintosh fire disaster our special probe has uncovered numerous other treasured buildings at risk because they don’t have the fire-tackling technology experts recommend. Of 37 buildings we asked about, just eight had the systems recommended by our experts while two had partial coverage and 25 didn’t have any of them at all. The worrying list includes buildings such as The Scottish National Portrait Gallery in Edinburgh and Kelvingrove Art Gallery, Glasgow, which have both undergone multi-million pound refurbishments. Following the destruction of the art school we can reveal Hill House, also designed by world-famous Scots architect Charles Rennie Mackintosh, could be at risk. Building inspector and fire engineer Geoff Wilkinson said: “We should be looking to get fire suppressions systems installed in our historic buildings. “These can spray out a high-pressure water mist to suppress fires. “There have traditionally been concerns by curators that these systems could cause more damage than a fire itself. “However, the technology has developed substantially and it’s not true anymore that these systems will damage the exhibits. In addition to the historic importance of the buildings themselves, many of the properties without these systems are home to priceless collections of art and antiques. Kelvingrove Gallery is home to Salvador Dali’s masterpiece, Christ of St John of the Cross, valued at more than £60 million. Similarly, Titian’s famous painting Diana and Callisto was saved for the nation after a £45 million deal was agreed with owner the Duke of Sutherland in 2012. However, the painting’s home at the Scottish National Portrait Gallery in Edinburgh doesn’t have either of the systems recommended by our experts. Falkland Palace in Fife is packed with 17th Century Flemish tapestries, elaborate painted ceilings and antique furnishings. Aberdeen Art Gallery houses one of the most important art collections in the country, including works by Francis Bacon, Damien Hirst, Monet, Renoir, Toulouse-Lautrec and Degas. While Beatrix Potter’s former home, Hill Top in Cumbria, is a national treasure featuring the author’s furniture and china. Yet none is protected with an advanced system that could save them from a blaze. Stewart Kidd, an expert in preventing fires in historic buildings, said: “Very few Grade A listed buildings in Scotland have sprinklers or fire suppressions systems. Mr Kidd has been involved in installing the systems in numerous historic buildings, including Stirling Castle and the National Library of Scotland. He said numerous buildings would benefit from a fire suppression system but may not have them as they are not required to by law, and added organisations may not install them due to the costs associated and conflicting demands. He argued Historic Scotland’s work on protecting Scotland’s built heritage from fire is “streets ahead of anything” done in England but agreed more could be done nationally. He said: “Mist fire suppression systems, like the one that was being installed in the art school, have been around for 10 or 15 years. “Some architects worry sprinklers will false alarm and all go off at the same time. That’s not the case. “They only go off if the sprinkler head reaches a substantial level of heat around 68C and only the head in the area of the fire goes off. “Scotland alone has 600 fires in listed buildings every year. If we don’t do something we’ll lose more buildings. Our investigation failed to establish exactly which systems are in place in other national treasures such as William Wordsworth’s first family home Dove Cottage in Cumbria and the Queen’s residence in Scotland Balmoral. A lack of funds is believed to be at the heart of many of the failures to fit fire-tackling technology. Stirling Castle, Edinburgh Castle and Duff House in Aberdeenshire are managed by Historic Scotland and all have sprinklers or fire suppression systems. Historic Scotland said it has updated its fire safety management strategy, and appointed two fire safety advisers to implement it. NTS said all of its properties have a robust fire management system in place, which is based on evaluation of risk and methods of control as well as robust testing, maintenance and training. Two of its properties Newhailes House and Broughton House have sprinklers while Culzean Castle has a fire suppression system. The National Galleries of Scotland said it employs sprinkler systems where there is a perceived particular threat of fire or where there are other additional risks. It said the “introduction of such systems to other galleries has been risk assessed and discounted”. It added that all its buildings have full fire detection systems installed. Edinburgh City Council said the venues we asked about have hand-held fire foam and water extinguishers and fire blankets. The council has also announced it now plans to carry out fire safety inspections in its museums, monuments and art galleries following the art school fire. Audits will be carried out at several venues including many of those highlighted in our probe. Glasgow Life said there are sprinklers throughout The Burrell and the Glasgow Museums Resource Centre. It said there are no plans to install fire suppression systems or sprinklers in any of the other buildings we highlighted. A spokeswoman for Buckingham Palace said Balmoral complies with legal requirements and robust fire safety procedures but would not discuss details. Aberdeen City Council said Aberdeen Maritime Museum has a sprinkler system but added that the other properties we asked about are protected by fire extinguishers and fire alarms. The National Trust said the properties we asked about are protected by fire alarms of varying types while staff are trained in fire safety.